Blog › Do you require a Multiple Letterboxes system...? 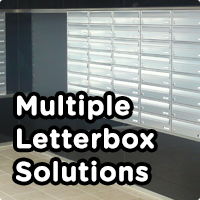 Do you require a Multiple Letterboxes system...? We ensure we understand all our customers needs when they wish to purchase a new letterbox system! If you require a letterbox system which can hold multiple companies or residents post, we can help. Whether it's for the office, or an apartment block, we can provide the perfect design from our range to match the interior or exterior of your building. Our variety of colours and multiple letterbox styles available are endless...door side panels, surface mounted, recessed, through the wall and free standing. Although post is used less frequently nowadays with the advent of email and other online communication tools, we require it for so many special occasions, those numerous Birthday cards throughout the year...Mothers day wouldn't be the same without a card or two, or perhaps you're awaiting that famous postcard from a loved one abroad...We still reply on the postal system to deliver so many correspondence, with those important official legal and professional documents to file, whether they are delivered to student accommodation, a multiple occupancy house, business offices or apartments. Bills are yet another source of document, which still use the postal system to communicate with both new and existing customers. With many years experience within the industry, we make sure we prioritise the security of post delivered to our individual and multiple letterboxes, for residential or commercial properties. Post should be easily accessible for owners at all times. You may choose a recessed letterbox wall for a spacious lobby...or perhaps a free standing multiple letterbox for outside an apartment block? Whichever multiple system you decide upon, we ensure high-tech manufacturing and an installation service if you should require it, simply contact us to enquire today. So find the perfect multiple letterboxes within your budget!